"Love me, that's all I ask of you." Memorable Moment - I grew up listening to the Phantom soundtrack, as my mum is a big fan of the musical. I knew all the music long before I saw the production on stage. 'All I Ask of You' was always my favourite Phantom song. Not only is it a beautiful song, but the lyrics speak to the romantic in me. "Love me, that's all I ask of you" is such a powerful statement because it really is the one thing we all want and ask of our partners. We just need our significant others to love us, that's all. 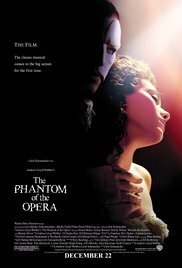 So my memorable moment in this movie has got to be the rooftop scene where Christine and Raoul sing this wonderful song, as the Phantom looks on from the shadows. Watching this scene, I always get an odd satisfaction out of seeing the Phantom so upset and jealous. His obsession with Christine is creepy to say the least. I've always found it hard to understand him. Sure, having to watch the love of your life profess their love to another man is heartbreaking. But for me the Phantom doesn't deserve Christine, so this scene always leaves me cheering for the love that Christine and Raoul share.